IKEA, the online furniture-selling giant, has now designed a line of furniture for pets. IKEA modern cat furniture was developed keeping in mind the needs of animals and their behavior. The company consulted a veterinarian, so the products were animal specific, and not just an animal version of furniture for humans. IKEA’s miniature furniture for pets consist of furniture for both cats and dogs, with how to guides. You can even make a guinea pig paddock using their conventional furniture components. 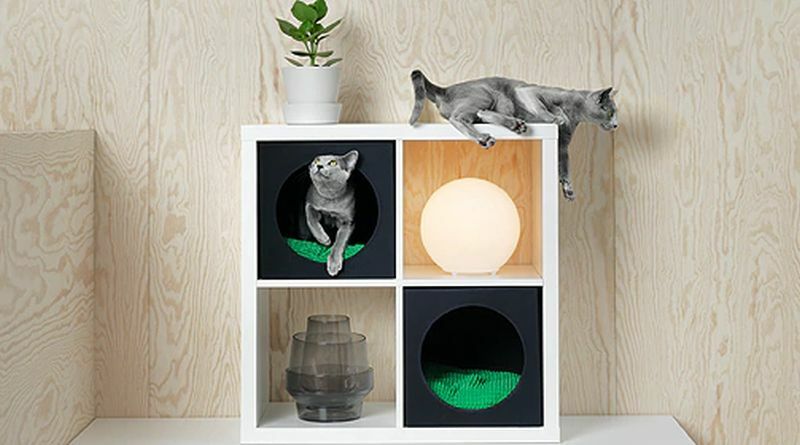 IKEA modern cat furniture has been designed keeping in mind the need for cats to exercise, and their tendency to sleep and play in close proximity with their owners. Their products are beautiful and affordable, as can be noted from their pet version of the famed Klippan sofa. Cats have the yen to scratch, as you well know. You probably have one at home for your feline friend. But not one, which has been specially designed to fit the ‘architectural modernism’ or the ‘art museums’, as the Japan based company Neko claims. The company manufactures only a limited edition of 22 cat scratching posts in one year, which is made out of Japanese hardwood and crafted by Hida craftspeople. The tree has a marble base to stabilize it, and the body is wrapped in Japanese hemp-cord, which allows the cats to scratch it to their heart’s content. The cord can be replaced after it gets tattered. Cats can climb the tree and rest on the ‘branches’ to get the same experience as that of a real tree. Another thing you’d like as an owner is that the tree is made without using nails, and the wood is treated with urethane, which gives the same feeling as real wood, and makes this one of a kind cat tree durable. This is one of top picks for miniature furniture for pets, and you can see why it is. You would do anything for your canine, and the owners of this Ho Chi Minh City house spared no effort either. 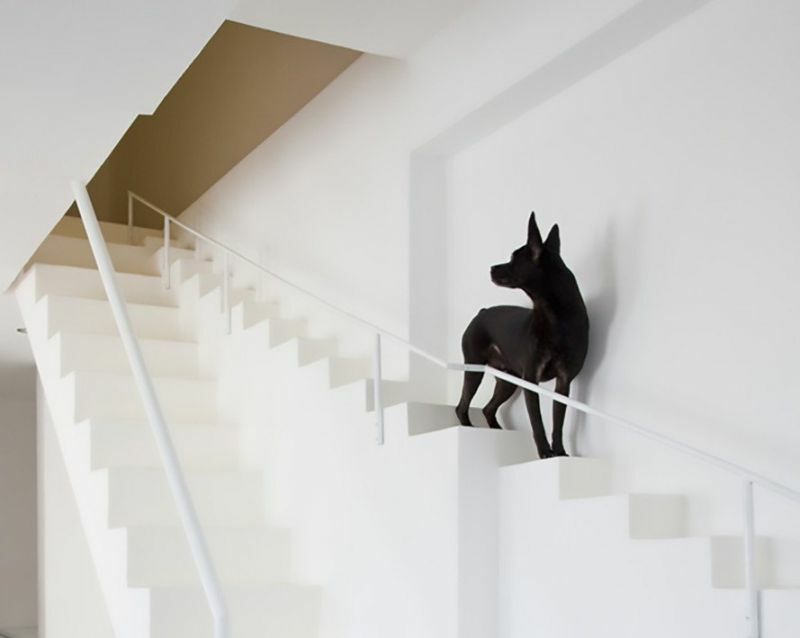 They renovated their home to include a special staircase for their beloved dogs. The staircase meant only for the dogs have shorter rises as well as narrower treads so that they tread easily on them. Miniature furniture for pets, like this bed has been designed by Tateyama Wood Craft and is available of black cherry or walnut. The company is well-known as furniture makers in Okawa, and they have made a nightstand too, to match with the bed. Another company, Hiromatsu Furniture in Okawa, has come up with the feline sofa, so that cats can recline easily in luxurious comfort on it. 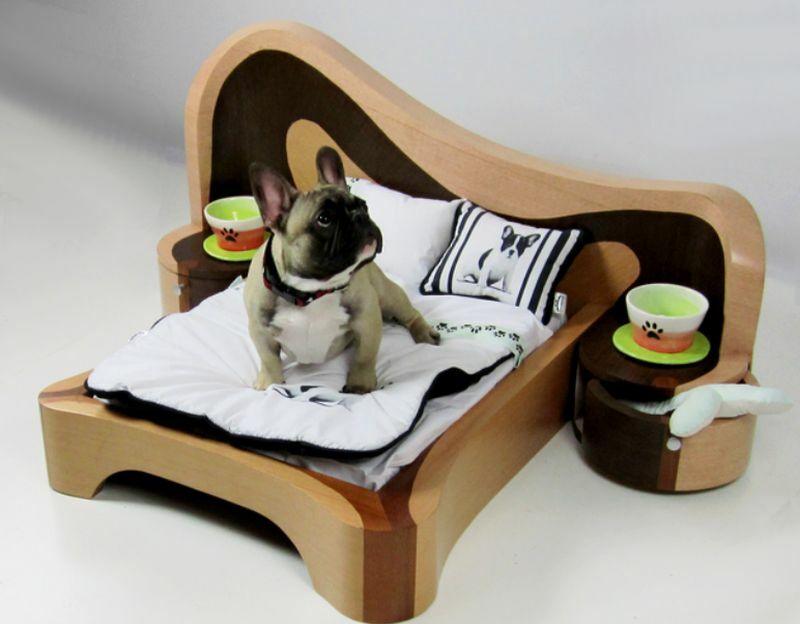 This bed is perfect for your canine, which is on the smaller side. It looks like a regular bed but has a nightstand built into it. Designed by Cedel, its modern design will fit beautifully into your modern décor. A little pricey, but price is not an issue when it comes to your beloved canine family member, does it? Another wonderful example of miniature furniture for pets. Japanese design studio Nendo designed a wonderful range of accessories for dogs which suit modern, minimalistic design. They have designed this miniature furniture for pets, including minimalistic dog house, which are tasteful and elegant. Their dog house could be one of the best small dog house you can buy. 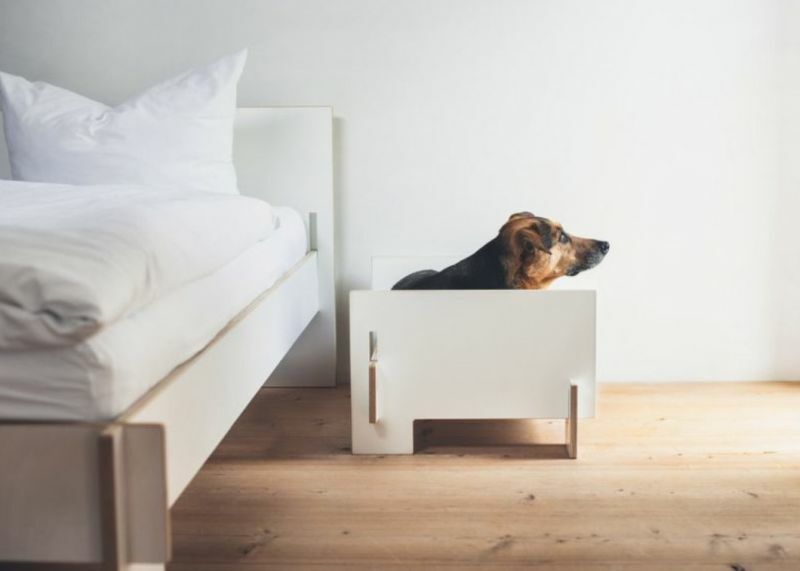 To match with the human flat-pack bed, German furniture expert Nils Holger Moorman created the doggie version of the flat-pack bed. The bed is called Klaffer, and can be placed next to the owner’s bed. Pets are an integral parts of their owners’ lives. They love being close to their owners, but sometimes they can and do get under the feet, especially if you’re having guests over. A Japanese dog owner had a special enclosure designed in the living area, where they have enough space to play and rest. The dogs have their own space yet they are immersed in the family’s life. The designer designed miniature furniture for pets, in this case the dogs, to fit into the enclosure. While you can buy readymade doghouses, you can also get one specially designed by an interior designer. Get inspired by this wonderful example of a sleeping nook designed by the architects at StudioAC, for a home in Toronto. If you have a cat as a pet, then you know how cats love scratching to keep their nails sharpened. 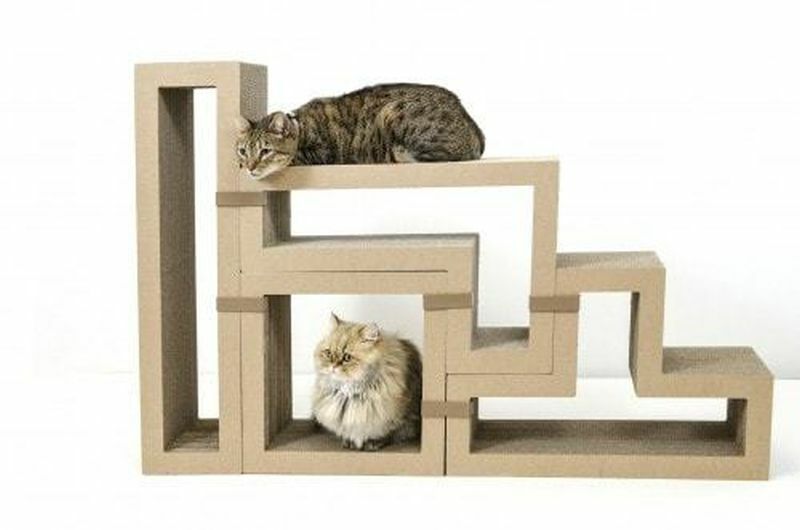 KATRIS’s cat tree is composed of modular blocks, which can be rearranged whenever you want. The flexibility of this cat tree would keep your cat busy and interested all the time. The blocks are made from 200 heavy duty sheets paperboard and can support 300 pounds at least. The paperblocks can be wall-mounted too, saving space and making things more interesting for the cats. We really loved this futuristic looking egg bed. It’s a good match for contemporary homes and can be used for both cats and small dogs. Stylish, warm, cozy and easy to clean, this egg bed’s design is really great. Pets’ accessories are designed so well, that sometimes they’re even better than those designed for you. Miniature furniture saves space, look great and suit any budget. No more unsightly accessories any more, for your beloved pooches and felines.